Always Check the Label ! 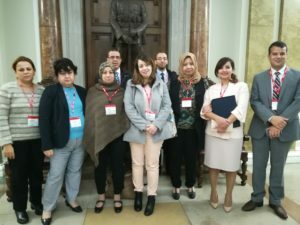 NI-CO recently organised a study programme for 7 senior government officials from Algeria to visit the UK to learn about effective food labelling and consumer education with regards to food nutritional values. The visit was organised under the EU funded institutional twinning project which NI-CO has been delivering in Algeria since January 2017: Support to the Institutional framework for the collection, processing and promotion of information in relation to consumer protection and was designed to allow participants to experience at first-hand how the UK’s leading consumer protection authorities are helping to tackle problems of diabetes, obesity and heart disease through targeted consumer education initiatives. During the 5 day programme, delegates were hosted by Invest Northern Ireland, the Chartered Trading Standards Institute (TSI), the Department for Business, Energy and Industrial Strategy (BEIS) and Haringey Council to learn about the management, planning and operational challenges of effective consumer protection programmes which meet EU and WTO standards. Presentations and interactive workshops were delivered on consumer policy and enforcement, emergency planning and resilience, food labelling and healthy catering campaigns. At the end of the week officials were given the opportunity to visit the Wolfson Institute in the University of London and the Obesity Health Alliance (OHA) at UK Health Forum to explore the UK’s latest advances in preventing obesity-related ill-health through targeted consumer education programmes to reduce salt, sugar and saturated fat consumption. By NICO|2017-11-07T13:19:20+00:00November 7th, 2017|News|Comments Off on Always Check the Label !